The day your baby starts walking marks the day to set aside those unnecessary soft-soled shoes that fall off half the time. Shoes go from completely unnecessary to very important very quickly because little ones seem to learn to run just as soon as they learn how to walk! And because little feet are often unsteady and tend to trip and scrape as they walk, it’s important to invest in a good pair of toddler shoes to protect your little one’s feet. Comfort. You don’t want to wear uncomfortable shoes, and your toddler won’t either. Find something that fits well but isn’t too tight or restricting. Stays on. There’s nothing more frustrating than losing a shoe at the park or having your baby toddle over to you over and over again and ask to have the shoe put back on. Easy to put on. I like having shoes with velcro or an easy closure so we aren’t taking the time to tie tiny shoes whenever we go out. Durability. Of course, it’s also nice to have a shoe that is durable and will last through the feet dragging and tripping that will inevitably happen. Versatility. 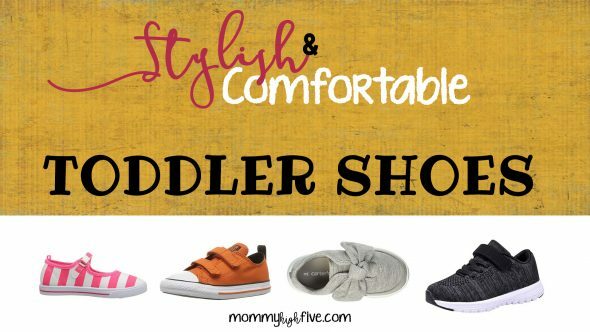 Because your toddler will grow out of the shoes fairly quickly, it’s also good to find shoes that are very versatile so you don’t need more than a pair or two. Style. I also love stylish shoes because they’re just so cute on those tiny feet! 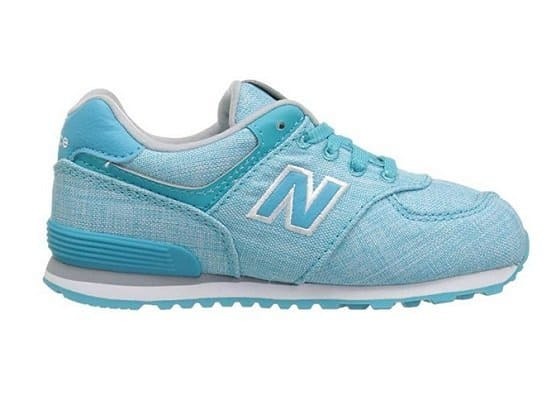 If you are looking for reliable, comfortable sneakers, these tiny New Balance shoes are perfect. 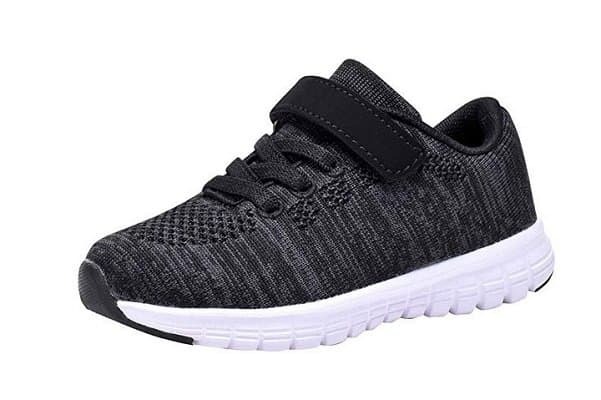 Not only are they stylish and easy to put on a rambunctious kid, but they have great traction so your toddler can run and play on the playground without them sliding. They come in black to hide the dirt, but they also have fun options for pink, blue and neutral accents. New Balance shoes are another good option for toddlers with wide feet. The biggest downside to these shoes is that they have shoelaces, so you might be retying them several times a day. However, they are the great quality you would expect from New Balance. 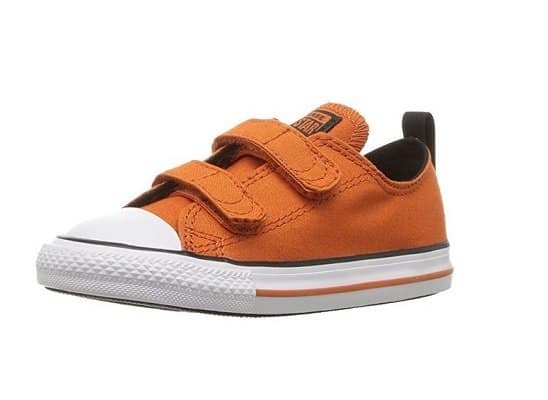 Nothing is cuter than little people in big people shoes… honestly, how can you say no to these tiny Converse shoes? Something people worry about when it comes to buying Converse is that the canvas part of the shoe will wear out. 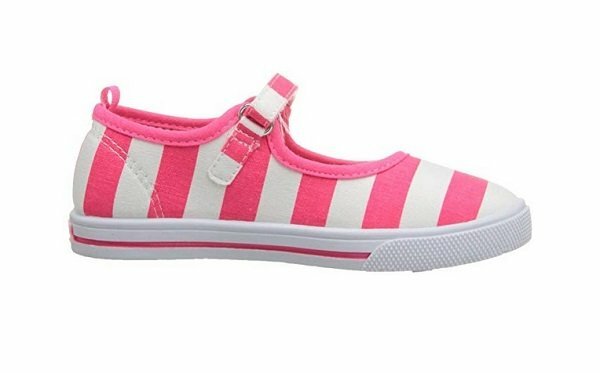 What’s great about these toddler shoes is that they are so small that most of the shoe is just a heavy rubber sole. They’re extremely durable and come in so many colors that would be perfect for either gender… even a sweet pink for a girl! The price on Converse can vary. If you find a good deal, order an extra larger pair for later. These shoes are tough! They’ll likely withstand the running-arounds of even the wildest tot. If it’s sweet little girl toddler sandals you’re after, these are my top pick! 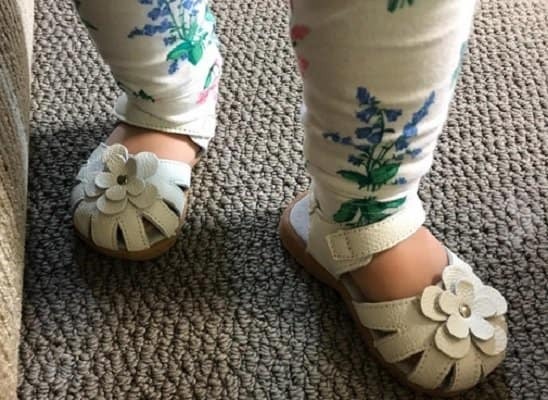 Not only are they adorable with their little flowers, they also have a closed toe to protect your toddler’s feet, and they are easy to put on. They’re fancy enough for church or even a wedding, yet casual enough for everyday use. They run about a half size larger than standard shoes, so consider that if you decide to purchase them. The Femizee sandals are available in four different colors and two different styles. These shoes are a great price for their quality. Could it get any cuter than this? 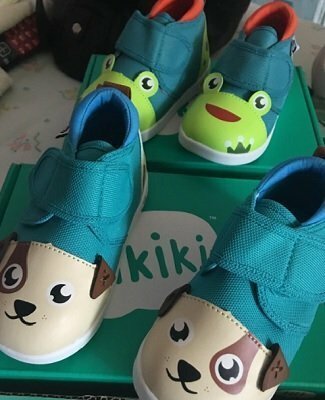 The ikiki Squeaky Shoes for Toddlers aren’t just cute; they are good quality and fun, too. These high top shoes provide great support for toddlers who are still getting the hang of walking. Good traction means your child won’t slip and fall in these shoes. A squeaker in these shoes provides some entertainment for your little one. It’s not just for fun, though. The squeaker only makes noise when your child walks correctly, from heel to toe. This encourages your child to walk properly, ensuring good walking habits start early. The best part is that there is a switch that can turn the squeaker on and off! Your child will love the darling characters that come on these shoes. With nine different characters to choose from, including an owl, a panda bear, a frog, and a skull, there is sure to be one your child will love. Who doesn’t love a sweet pair of moccasins on a little child? BirdRock Baby Moccasins are great shoes for infants, toddlers, and preschoolers. With over 30 chic styles to choose from, you might have a hard time deciding on just one! But that’s ok because the price is such that you could get more than one pair! Let’s be real here. These shoes aren’t for outdoor play. They have soft soles that will wear out very quickly if worn outside. However, they are excellent for wearing inside. An elastic band in the top of these toddler moccasins makes them easy to put on and keeps them from falling off. Because they are made of 100% genuine leather, these shoes wear well and will likely last long after your child outgrows them. Another bonus with these shoes is that for each pair purchased, a day’s worth of food is donated to a hungry child. You get a darling pair of moccasins and help other kids at the same time! It’s a win-win! UGG boots on a toddler–need I say more? 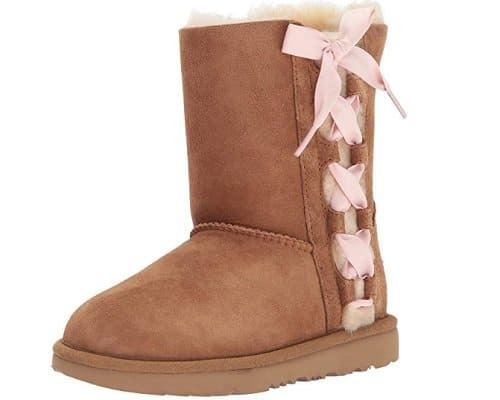 These boots are so adorable, and they come with the exceptional quality associated with the UGG brand. With authentic dyed sheep fur from Australia, genuine leather, and a synthetic sole, the materials in these boots are of exceptional quality. Toddlers are messy, and these boots have a good answer. They have been pretreated to repel stains and moisture. While these boots are darling and great quality, they are quite expensive compared to the other options on this list. Talk about adorable! These Lola Mary Jane toddler shoes have a solid structure and easy closure that will keep them on your toddler’s feet, but the faux buckle gives them a more mature, stylish feel. These shoes are incredibly comfortable. There are nearly a dozen styles to choose from, so you’ll easily find one that will fit into your daughter’s wardrobe. My personal favorite is the Navy. The durability of these shoes is questionable as they’re made out of canvas, so they might be a great choice for the smallest sizes that are grown out of the most quickly. It depends on what you plan to use them for. Rough playground and sandbox play? These won’t hold up forever. Church and more formal wear? Absolutely choose these. 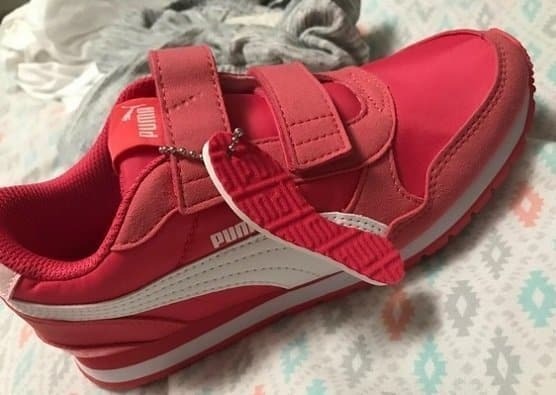 If you are looking for lightweight, comfortable sneakers, these tiny Pumas are perfect. Not only are they stylish and easy to put on a rambunctious kid, but they have great traction so your toddler can run and play on the playground without them sliding. They come in black to hide the dirt, but there are also fun shades of pink if you have a little girl with that preference. With this shoe, it’s good to order a size up because the shoes tend to run small. These shoes have durable velcro that doesn’t fray, but the fabric on the shoe may wear out fairly quickly depending on how hard they’re played with. Overall a solid choice of shoes for both boys and girls. How darling are those bows?! If you’re interested in style, these shoes rise to the top of the pack. Their trendy colors and designs would perfectly complete any little lady’s ensemble. Plus they’re Carter’s brand, which is a brand that millions of parents use and has never let me down. Honestly, most of my baby’s wardrobe is Carter’s. 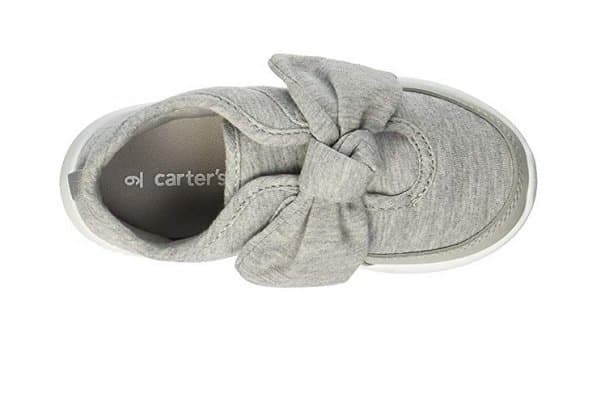 I love Carter’s for their cute styles and durability, and it’s clear that they design their clothes and shoes with great intention. My biggest concern about these shoes is that they’re slip-ons, which means they have a greater chance of falling off than a shoe with velcro or laces. There’s also the possibility of getting stretched out over time. However, these shoes are well-designed with heavy soles, and they’re perfect for a newly walking toddler with a fashion-forward wardrobe. 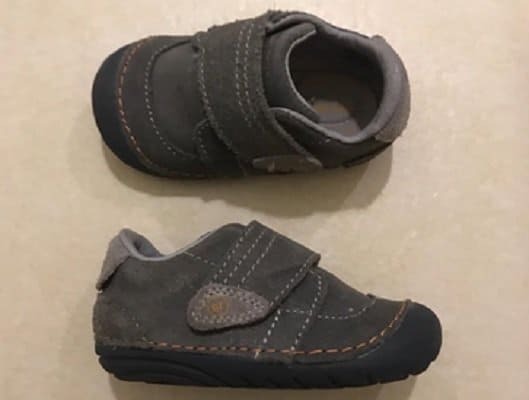 These highly functional Stride Rite shoes feature all the bells and whistles: a memory foam insole, easy velcro closure, rounded edges and soles for better balance, an antimicrobial lining, and “deep flex grooves to enable baby’s natural movement”. They’re made of suede and rubber, so they’re likely to last through every trip to the zoo or run around the park. 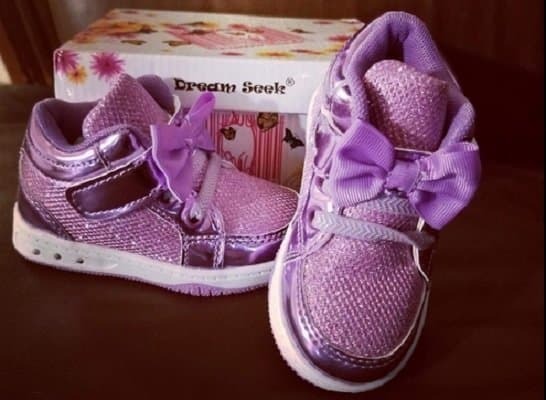 These shoes come in a variety of sizes and would be an ideal choice for a toddler with wide feet. One downside is that the shoes are a little more bulky than your standard canvas shoe, but that does add to their durability. The extra weight can make new walkers feel more secure in their steps. 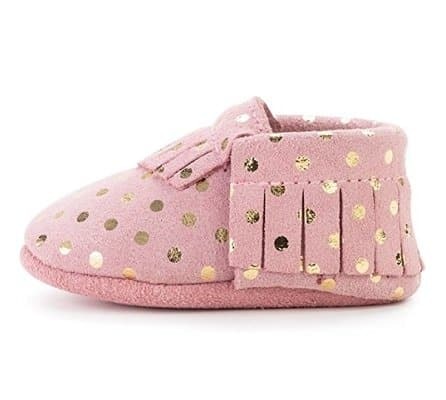 These shoes are on the pricey side, which is worth noting because your little one will likely grow out of them fairly quickly. These are the most glamorous shoes you’ll ever buy for your toddler. Not only are they sparkly with a unique bow, but they also light up when walked in. If your toddler didn’t like wearing shoes, those days are now over! The biggest downside of this shoe is that your child will want to wear them every waking moment, and that means they’ll wear out very quickly. The sole isn’t very durable and there isn’t great arch support, so the shoes are more for looks and fun than they are for durability. For just $20, though? Your toddler will have a blast with the lights and get many compliments! If you’re looking for a good summer tennis shoe, these fit the bill. They’re made of woven fabric, so they’re breathable and perfect for hot weather play. They also have a bendable sole, meaning they move well with your toddler’s feet. They’re lightweight, easy to put on, and come in lots of colors that are appropriate for both genders. Note that the sole is made of foam, which means that these shoes, though lightweight, don’t have great traction. You toddler may be more prone to slips and falls. If you’re buying shoes for a brand new walker, it may be best to skip these shoes in favor of something with more traction. 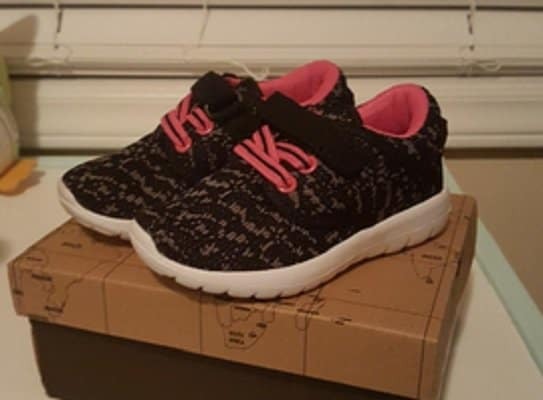 I’d recommend these shoes for an older toddler with more walking experience. 2) These Umbale Boys & Girls sneakers rise to the top for parents hunting for tennis shoes for their tots, and there’s a clear reason why. The shoes are stylish, come in many different colors, and are tempting at their price. They’re the lightweight, breathable running shoes little athletes dream about. These shoes, unfortunately, have a foam sole, which means there isn’t as much traction as other shoes. Luckily they have a rubber heel and toe, which prevent slipping to some degree. The Umbales are a great choice for their price point, though. 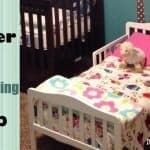 They are overall well-made and will likely last as long as your child needs them. At the end of the day, durability wins over price in my book. My top choices for toddler shoes are the New Balance and the Converse. They are easy to put on, work with any outfit, and are absolutely worth the money. I always love to have a pair of summer sandals on hand for my kids, too, and the Femizees are perfect for my daughter and remind me of shoes I wore and was fond of as a kid. If these are your baby’s first-ever shoes, expect shoe shopping to be a bit of trial-and-error at first. In time, you’ll learn your toddler’s preferences and style of walking and you’ll be able to choose the perfect shoe in no time.